With 2019 fast approaching, Xeneta looks back over the last 12 months to highlight key developments across the industry. We will focus on the Far East - NW Europe trade in this part-1 blog post. 2017 was a positive year for carriers, with rates during the first six months on the FE - NWE route in particular, at healthy levels. However, as the market entered Q4, weakness began to materialize. Although carriers were able to lift rates in the run up to Chinese New Year in Feb-18, which is not unusual, a prolonged slump in rates sent them tumbling from $1,734 FEU to around $1,208 FEU, reflecting a decline of 30.3%. Demand seemingly then recovered at a slower pace than it has done historically, resulting in an average freight rate of $1,538 FEU for the first six months compared to $1,781 FEU in 2017, down 13.6%. This decline in rates couldn’t have come at a worse time, with bunker costs during the same period rising significantly. The toxic mix of declining freight rates and increasing costs resulted in Maersk issuing a profit warning, thereby cutting its full year forecast. The Danish carrier said its fuel costs rose 28% year-on-year during the first half of the year. 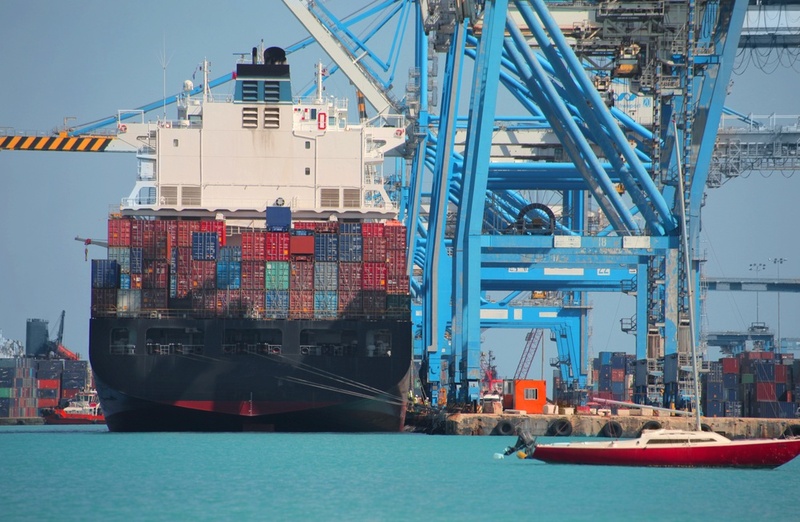 The result was a standoff between carriers seeking to recoup some of the additional costs and those with fixed rate contracts, either with or without a floating bunker element. By May-18 lines were able to increase rates, with CMA CGM and others announcing FAK rates of circa $1,600 FEU. Despite the recovery it still points to an over reliance on public rate announcements. For example, some market participants may not be able to recall the last time carriers were able to meaningfully lift rates organically, i.e without the use of GRIs or planned FAK rates, highlighting the continuous battle they face in maintaining or improving revenue streams. However, as the market entered Q3 rates still developed positively for carriers. 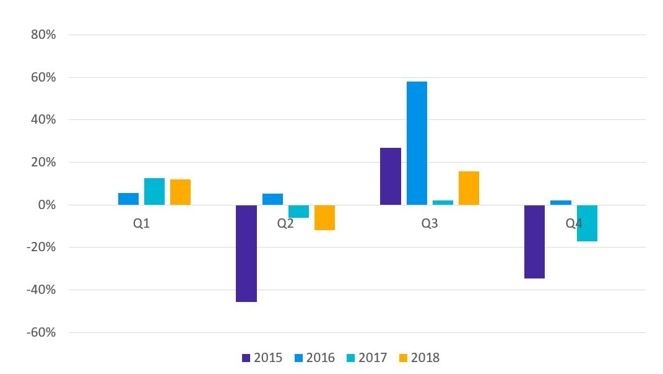 In recent times there’s been question marks over the impact that peak season truly has on the market, but Figure 1 highlights Q3 rates continue to carry a premium compared to the previous quarter, suggesting it does still have an impact. Note: Carriers have still been able to charge a premium for rates in Q3 when compared to the previous quarter, albeit this has been reduced in recent years. Elsewhere, contract developments have been mixed for carriers, with average rates year-to-date more or less in line with the same period a year earlier. With short market rates still fluctuating considerably and contracted rates not necessarily falling to the same degree when the market declines, the discount shippers have been able to achieve for long term rates has been eroded slightly year-on-year. 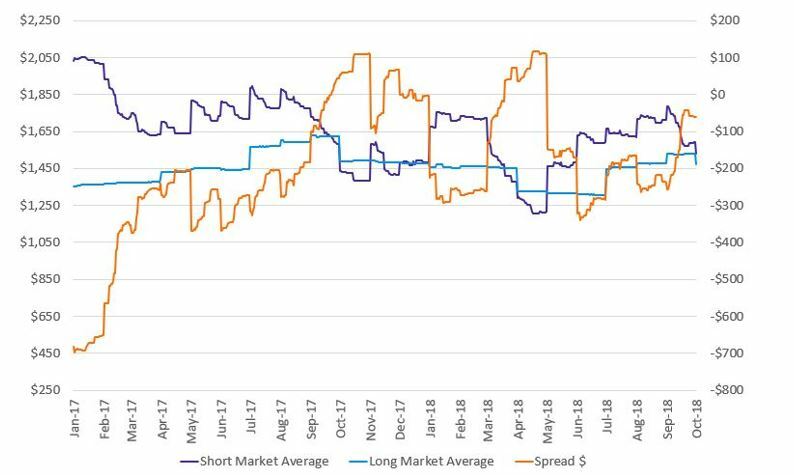 Fig 2 highlights the spread or difference between the two, has narrowed from an average discount of 13% in 2017 to 10% in 2018. Whilst, shippers on contracted rates can still expect to pay less on average than those in the spot market, it’s not guaranteed. Therefore, market participants may be tempted to move to a floating mechanism that tracks the market, thereby reducing the pressure on carrier - shipper relations when there’s a large swing in rates, as witnessed after Chinese New Year. Note: Although rates started 2017 positively, they have since trended downwards. Alarmingly carriers still rely on planned FAK rates to maintain or increase levels, indicating market fundamentals and carrier discipline are still lacking. Meanwhile, the financial benefit of a fixed rate contract has reduced slightly compared to 2017. As the year comes to a close, shippers should expect rates on average to be lower in Q4, as suggested by Fig 1. However, attention may be focused on the proposed surcharge mechanisms being put forward by lines a year ahead of new IMO Sulphur regulations, although as history has shown, carriers have been largely unsuccessful at recovering fuel costs. In our second part blog post, we will focus on Far East - US West Coast. Stay tuned. Make sure to check out our Resource center, which includes quarterly review rates webinars, best practices webinars, whitepapers, ebooks and other assets meant to accelerate your knowledge of ocean freight procurement.